Adapter plate for LCD-screen without groove in backside, for ProAdapt. The choice when you want to install a monitor without a vertical slot on the back (with a hole underneath for thumb screw attachment, (“-thread) onto a ProAdapt product. Attention! Please read all of the instructions and look at the pictures before atttaching the screen mount adapter. 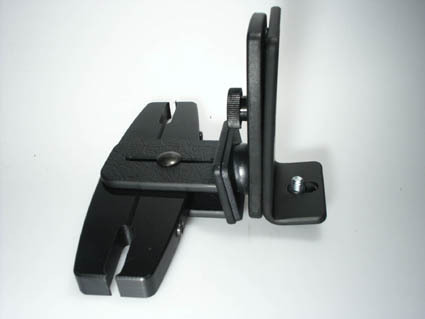 This screen mount adapter is used for attaching screens with a hole underneath for thumb screw attachment i.e. camera tri pod mount. 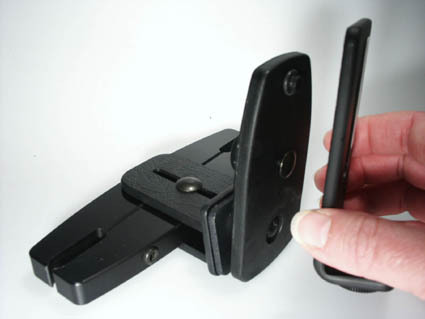 The adapter has a vertical slot that attaches to ProAdapt products, head rest screen mounts (with and without flexible arm), screen mounts between front seats etc. 1. Loosen the thumb screw on the back side of the screen mount, so the button on the front side can be pulled out a few millimeters from the screen mount (do not remove it). Place the adapter onto the screen mount. 2. 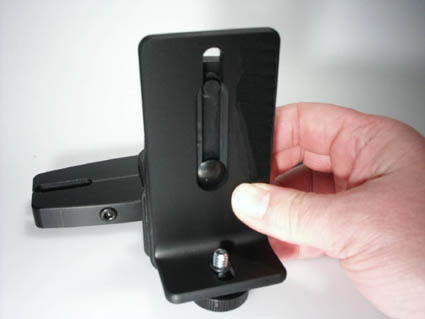 Place the button on the screen mount into the vertical groove in the adapter. Slide the adapter downwards so the button holds the adapter to the screen mount. 3. 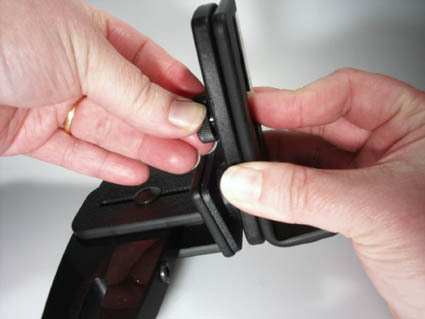 Hold the button and tighten the thumb screw on the back side of the screen mount so the adapter is properly in place. 4. The screen mount adapter is in place.